With this 3 Way Rolling Grid Display - 5 Foot you can roll all over the store. This floor rack with wheels can go wherever it needs to go at a moments notice. If your tight on space but want to give your shoppers some variety this retail display is the thing for you and your business. Color options of black, white and chrome is available for you to select from that best fits your needs. The portable display is a great way to show anything from hanging merchandise to candy bins. 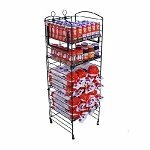 This space saver display rack is ideal for impulse items. When used with grid wall bins and other accessories you can create the display that suits you and your customers best. Have some fun and start rolling around. Who knows where you might end up. Order your metal freestanding floor display today at Candy Concepts Inc. for all your wholesale needs. 3 Shelf Rounded Top Beverage Racks - 17"